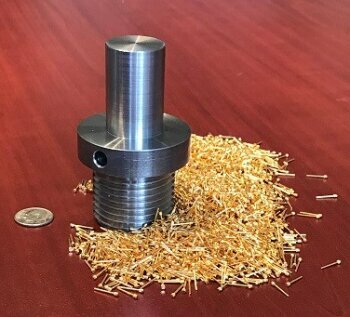 A picture says 1,000 words… MPC’s incredible precision machining capacities range from small to large parts, low to high volume, and stainless steel to brasses to exotics. In every case, parts are produced to the same exacting high quality standards you’ve come to expect from MPC. This steel part pictured above has a 2” outside diameter and is 3” long making it one of the largest precision parts we have produced. Used in the woodworking industry it has a high-quality thread as well as a burr free cross hole. In contrast, the gold-plated parts next to the steel part, used in the electronics field, have a very fine knurl on one end while the shaft has a tolerance of +/-.0005” on the smaller turned down diameter. All operations are done complete on the machine (our #1 philosophy!) even the knurl which is created by a special tool that allows the material to continuously spin during its creation. Often, the gold plating of these types of parts is our biggest challenge, since they often get lost in the process! Commitment Beyond Measure… we dedicate ourselves to serving all your needs, BIG or small!